The NBA won’t announce its Rookie of the Year until June 2019. 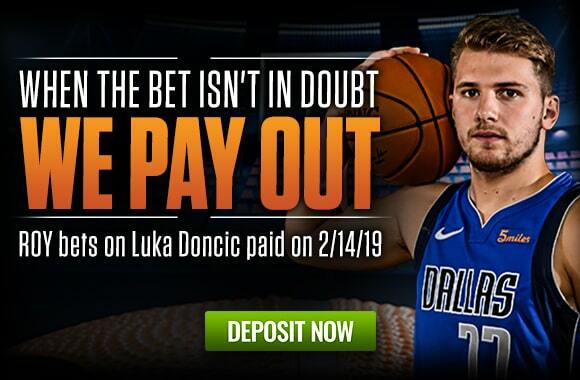 But, in an unprecedented move, MyBookie has decided to pay out everyone who bet on Dallas Mavericks forward Luka Doncic to win the award. The No. 3 overall pick in the 2018 NBA draft, Doncic is averaging 20.8 points, 7.1 rebounds and 5.5 assists per game. At +300 prior to the season, MyBookie received heavy action on Doncic. As a result, we’ll be paying out close to $150,000 to customers who otherwise would have to wait four more months to receive their winnings. Enjoy a 100% Sign-up Bonus by entering promo code ZION100 in the cashier page. Minimum deposit to qualify is $100. But that’s not all: MyBookie also is offering a risk-free bet on Duke star Zion Williamson to win the 2020 NBA Rookie of the Year at +300 odds. If he wins the award, you win. If someone else takes the title, MyBookie will refund all bets on Zion to win Rookie of the Year. You must wager on Williamson between Feb. 14 and Feb. 18 in order to be eligible. Williamson is the projected No. 1 overall pick in the upcoming NBA draft. The 6-foot-7, 285-pound forward is averaging 21.8 points on 68.4% shooting at Duke. If you bet on someone other than Doncic to win Rookie of the Year, and something drastic happens between now and June 2019, we’ll sweeten the pot for you. If your player wins, MyBookie will give you double the payout. Will MyBookie offer early payouts in the future? It’s too early to tell. This is an expensive decision for us, and we need to gauge the response of our customers. But we do plan to continue trying new and creative ideas to make sure we offer you the best sports wagering experience possible for years to come. On February 14th, we are crediting the LUKA DONCIC ROOKIE OF THE YEAR as a winner. All customers who bet this will have their winning credited in the account in their account. All customers who bet on another Rookie to win will be credited as a losing bet. IF Luka Doncic does NOT WIN, the winning bet will be credited as a DOUBLE to customers who actually won. The Zion Williamson line to win Rookie of the Year in 2020 will be available from February 14th up to February 18th. A customer is able to bet on this line for a MAXIMUM of $25. IF Zion Williamson WINS Rookie of the Year, the customer will be paid out accordingly to the line established. IF Zion Williamson DOES NOT WIN Rookie of the Year, the amount put into risk by the customer will be credited back into the account in the form of cash.